Now available for the first time and exclusively produced for The Keyboard Company, the Topre Realforce88UB keyboard, in German layout, is a joy to type on. It incorporates Topre's patented 30 million key life cycle non-contact electrostatic capacitance switches with a switch weight of 45g. The subtle black on black keycaps with their tactile feel and N Key Rollover ensure fast and accurate input. What can I say? It's a joy to type on. I spent way too much time investigating before ordering the realforce. Although it's a bit pricey I certainly don't regret it. Feels luxurious with a nice thock and stabilizer clack. I was a bit hesitant going with black on black lettering, but turns out that's not a problem at all. Only minor gripe was the board not being completely flat and wobbling on its feet at first, but that was easily fixed. Best rubber dome keyboard you will ever find. The defining feature of this keyboard is obviously the switches. 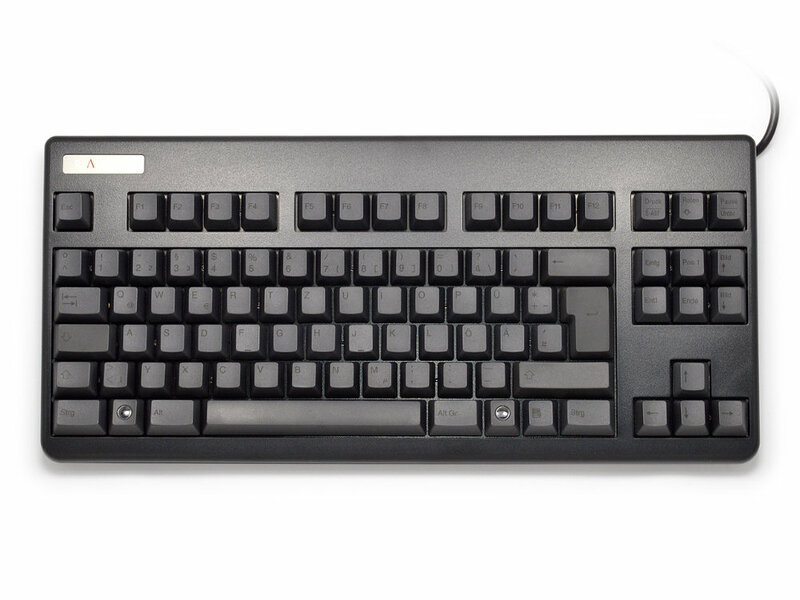 Topre switches are hard to find in lower-priced products, but they may be worth your money. They have little resistance after the initial bump, so you will most likely bottom out the keys (this isI assumeby design). Thankfully the keyboard manages to make bottoming out very silent. This makes typing on the Realforce much more silent than on any of the other keyboards I've used in the last 10 years (MX Black, Blue and Clear after years of rubberdome keyboards). I didn't particularly care about the labeling since I've been touch-typing since my previous 2 keyboards, with an alternative layout even, so I cannot say much more than what is already visible in the product pictures. What I will mention though is the cable: while the keyboard has a cable duct in three directions, the cable is not detachable, which is sad to see after my positive experience with the CODE keyboard. Coming from the current Macbook keyboard the Realforce sounds old fashioned, yet it is still superb when it comes to typing a lot. Switching the PC keyboard to Mac is as easy as using Google. A big Thank You to the Keyboard Company for the support, delivery updates. Everything went smooth. - Good manufacturing quality Made in Japan - made for me. - Heavy enough to not slide on your desk, when typing on it. - Like the Topre Switches, very comfortable, not straining your fingers! The Realforce 88UB has instantly become my favorite keyboard. The build quality is excellent and the PBT keycaps are a such a pleasure to type on. The 45g Topre switches are just perfect, even if you're used to heavier switches. I would definitely recommend this keyboard to all searching for a solid keyboard with TKL form factor. Unfortunately the black on black dye sub letters are hard to read. If you really need to see the legends in low light condition - this keyboard is maybe not the best choice. Most probably you won't even find any ISO replacement keycaps for Topre switches. Otherwise - if you're ok with touch-typing - don't hesitate. I haven't regretted my purchase at all. This black beauty is really far beyond expectations.